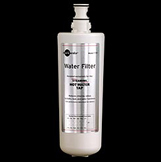 Designed for use exclusively with the InSinkErator Steaming Hot Water Tap system, the F-701R filter removes or significantly reduces levels of chlorine and other soluble impurities found in tap water which can affect its taste. The filter also reduces scale and remove solid particles. Replacement filters are sold in packs of two.